The goal of this grant is to recognize and renew our state’s educators. It supports the fact that true learning is lifelong and encourages educators to pursue their dreams and passions, explore new areas of interest, and expand existing talents and develop new ones. Where do your dreams and passions lie? What adventures have you postponed? Is there a country or culture you’ve always longed to explore? Do you yearn for a spiritual journey? What experience will help you broaden your students’ horizons? What inspires awe and wonder in you? The year I applied for this grant, I was completely stressed out from teaching. I certainly felt like I needed to be personally renewed, and things like swimming in Hawaii with the sea turtles, exploring Greece, and learning to horseback ride all sounded very appealing to me! Ultimately, I decided that I wanted to learn the practice of meditation. So, I started my grant by quoting the statistics surrounding teacher stress, teacher drop-out, etc., and then expanded on my proposal to not just study meditation, but also learn how to use it in the classroom. And I was awarded the grant! 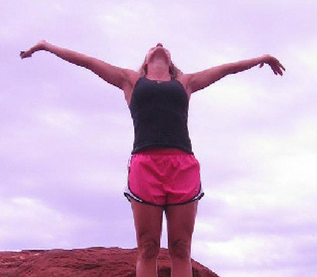 I spent 10 glorious days in Sedona, Arizona, doing amazingly wild and crazy things as I learned how to meditate, something I still practice daily. This was an experience of a lifetime and is perhaps a big reason why I now host Happiness Retreats and Live Events. Applying for and receiving this grant was life-changing. To my Indiana teacher peeps: You NEED to apply for this grant (it’s due September 1, 2017). To those located elsewhere: Do a little research and find out what kind of grants are available to teachers in your state. And to everyone: Always look for any opportunity to pursue your passions and rediscover your happiness. Because you DESERVE to be personally renewed OUTSIDE the teaching profession.